Fifteen-year old Callie is so withdrawn that she’s not speaking to anyone — including her therapist at Sea Pines, known to its guests as ‘Sick Minds’ — the residential treatment facility where her parents and doctor send her after discovering that she cuts herself. Her story unfolds primarily through dramatic monologues, gradually revealing the family turmoil that led to her self-destructive behaviour. Burdened with the pressure of believing she is responsible for her brother’s illness, 15-year-old Callie begins a course of self-destruction that leads to her being admitted to Sea Pines, a psychiatric hospital the “guests” refer to as Sick Minds. Although initially she refuses to speak, her individual and group therapy sessions trigger memories and insights. Slowly, she begins emerging from her miserable silence, ultimately understanding the role her dysfunctional family played in her brother’s health crisis. You say it’s up to me to do the talking. You lean forward, place a box of tissues in front of me, and your black leather chair groans like a living thing. Like the cow it used to be before somebody killed it and turned it into a chair in a shrink’s office in a loony bin. Fifteen-year old Callie isn’t speaking to anybody, not even her therapist at Sea Pines, the “residential treatment facility” where her parents and doctor sent her after discovering that she cuts herself. As her story unfolds, Callie reluctantly becomes involved with the “guests” at Sea Pines — other young women struggling with problems of their own. Although their “issues” are different from hers, Callie is drawn into the group, finds her voice, and, gradually, confronts the family trauma that triggered her destructive behavior. Cut is a compelling and compassionate look at a young woman’s struggle to overcome the impulses that led her to inflict harm on herself. You can read more about this book on the publisher’s website. 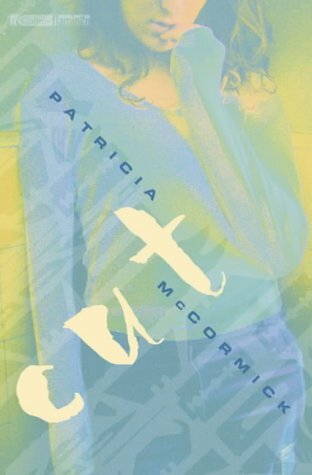 They have Patricia McCormick’s personal take on Cut and the first chapter available. HarperCollins, the publishers of the paperback edition of Cut, has an interview with Patricia on their website. Push has a short conversation between Patricia and David Levithan of Push. A book I read last year is called “Cut”. It’s about this girl who started cutting her self and stopped talking. It basically goes through what she goes through while she is in a hospital. The book reads as if you were her shrink. She refers to her shrink as you. I found this book a little bit after I first started cutting. I referred it to some of my friends and they like it, too. It really is a good book. A few of my friends have read [this book] and though I haven’t read it myself, apparently it’s ‘very very good’, and deals with a girl called Callie, who’s 15. She cuts herself to relieve her inner frustrations and guilt, after being burdened with the pressure of believing she is responsible for her brother’s illness. Callie begins a course of self-destruction that leads to her being admitted to a psychiatric hospital. It’s a book about a girl that just started cutting and her parents find out and goes into a hospital. It tells about what happened in the hospital. Short book, but good. It was a story about a young girl from the first person who cuts, and gets put in a rehab center. She is nicknamed “S.T.” there, because she gives everyone the silent treatment. And everyone wonders… what’s eating her? I’ve been reading a book called “Cut” about a 15 yearr old girl sent to a rehab home to help herself stop. I really liked it.